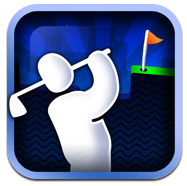 Super Stick Golf has simplified the idea of a golf game for iOS and forsaken graphics and realism for puzzles and gameplay. Forget the idea of Tiger Woods Golf and it's attempt to create a real life simulation or the cartoony simulation of Let's Golf. This is the most addicting golf game on iOS. There is really nothing else for me to say - just go download it. 99 cents gets you the universal app which works on IPhone/IPod Touch and IPad. Disclosure: I play it on the IPad, so I can't speak for the gameplay on the small screen of the phone.